Katie Holmes’ engagement ring is a very unusual one, featuring a five-carat Edwardian cut oval-shaped diamond at its center. Set in gleaming platinum with rose gold accents, it has a timeless look that ensures it will never, ever go out of style. Pave diamonds sparkle along the shanks, and a halo adds balance to the overall design. Although Katie Holmes and Tom Cruise divorced, their romance was a beautiful one that culminated in Tom proposing to Katie in Paris, atop the Eiffel Tower in June of 2005. The couple were married in November of 2006 in a Scientology ceremony that took place at a true fairytale location: the 15th century Odescalchi Castle, located in Bracciano, Italy. The marriage, which resulted in the birth of one daughter, Suri, ended in 2012. Like Katie Holmes’ engagement ring, this beautiful design from Brilliance features an oval diamond, rose gold accents, and split shanks embellished with pave diamonds. The setting and the diamonds it holds are the perfect complement to one another, creating a look that is at once opulent and timeless. Born December 18, 1978, Katie Holmes first gained fame for her portrayal of Joey Potter on Dawson’s Creek, which ran from 1998 to 2003. Since then, she has performed in a number of television shows and movies including Batman Begins, The Ice Storm, Abandon, and Don’t Be Afraid of the Dark. She has also performed on Broadway and has taken on several guest roles on TV shows including How I Met Your Mother. She has appeared in a number of advertisements, including spreads for Garnier Lumia hair color and clothing retailers such as The Gap, Coach, and Miu Miu. She ranked sixth in People’s 100 Most Beautiful People of 2011, and is both co-owner and brand ambassador of Alterna Haircare. Did you know that Katie Holmes co-founded a dance scholarship for children? The Dizzy Feet Foundation was founded with the help of Nigel Lythgoe, Carria Ann Inaba, Adam Shankman, and others. Its mission is to support, improve, and increase access to dance education in the US. What Our Experts Have to Say about Katie Holmes’s Engagement Ring. Katie Holmes’ engagement ring is enviable, indeed. Featuring a five carat oval-shaped diamond set in platinum with rose gold accents, it has pave diamond accents including a halo and additional sparklers set into its split shanks. 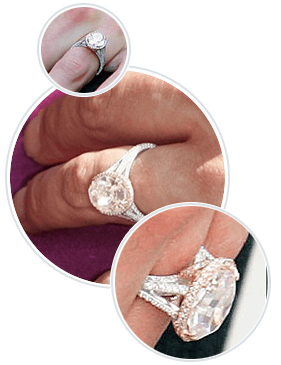 This engagement ring is an unusual one and is among the most coveted celebrity engagement rings Hollywood’s jewelers have ever produced. Celebrity engagement rings like the one Katie Holmes received from Tom Cruise typically come with price tags of six figures or greater. If you’d like to celebrate your love in celebrity style while saving money for life’s demands, choose Brilliance, where our team of experts help you design a custom engagement ring that suits your taste while giving a nod to Katie Holmes’ engagement ring – or to any other celebrity engagement ring that’s caught your eye! Whether you select an existing style or create something unique to celebrate the special love you share, you’ll love the way it adds sparkle to your life.